David Tait and Emma Rowden of the University of Western Sydney, Australia, put together a terrific session for the RGS-IBG conference in Edinburgh this July. Sponsored by the Geographies of Justice Research Group, and entitled ‘Justice on trial; Security and safety in court spaces’, the session responded to the ‘security’ theme of the conference by arguing that the geography of the courthouse has become a battleground for different philosophies of security. The three papers in the session provided three Australian case studies of issues that have also been hotly debated in Europe: placing defendants in glass cages in the courtroom, providing sanctuaries for vulnerable witnesses through video links, and the use of screening, CCTV and intelligence to manage risk. These studies contrasted overt physical barriers to contain people with the soft power of surveillance and customer services; security as a set of techniques for managing danger with psychological safety as a goal for supporting victims of violence and other vulnerable justice participants. I was fortunate to be asked to act as discussant for this session, and I was particularly struck by David Tait’s paper on courtroom cages, in which defendants are held whilst on trial. Increasingly defendants are being confined to cages within courtrooms based on security concerns, despite judgments by the European Court of Human Rights and two Australian Supreme Courts that suggest rights to a fair trial could be jeopardized by such confinement. The practice is more extensively used in England and Wales than elsewhere, where as David pointed out in his paper, the history of holding the accused in a ‘dock’ separate from their lawyers (rather than allowing them to sit alongside their attorney as is the custom in the United States) has contributed to this courtroom ‘geography’. His study reviewed the history of the practice, and the debates about physical confinement of the accused in court. 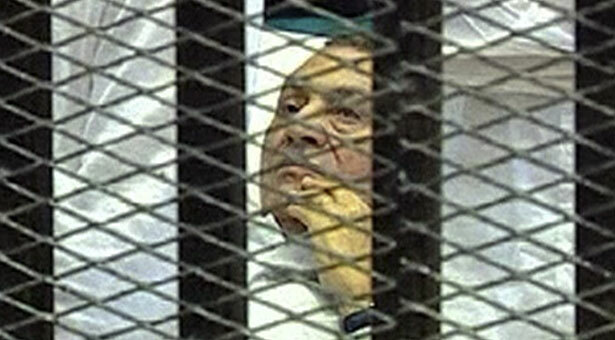 to the infamous image of former Egyptian leader Hosni Mubarak on a hospital bed inside a cage made of steel mesh and iron bars during his trial in a courtroom in Cairo. 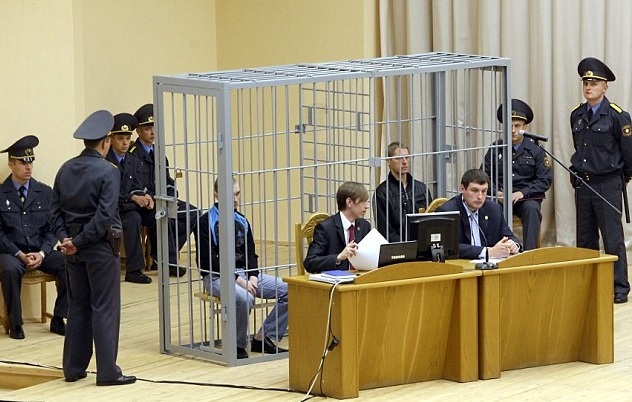 In his recent paper, David Tait points out that even where courtroom cages are not as extreme as those in Minsk or Cairo, any form of confinement, even the glass booths which have been used in Australia, can bring fairness and security considerations into conflict. Fairness, he argues, has an architectural or spatial dimension, in that courts are designed not just to achieve functional objectives, such as adequate sightlines and good acoustics, but also to reflect values such as “trust, hope and most importantly faith in justice”. 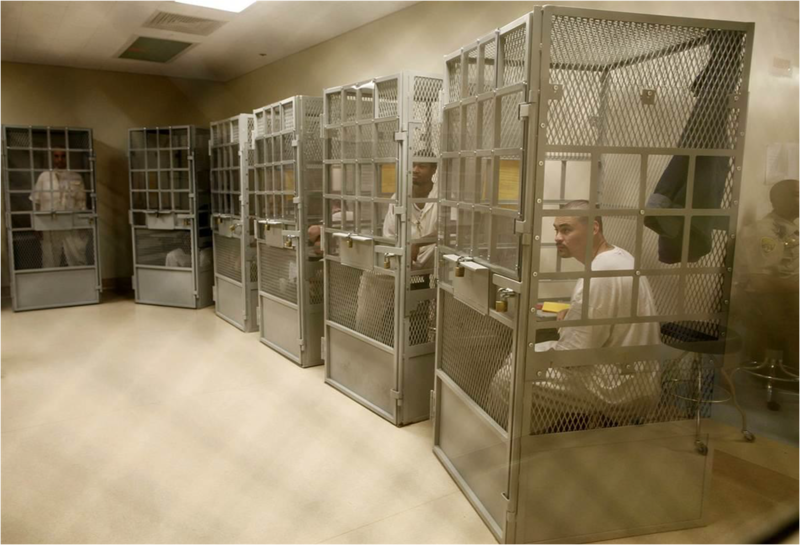 This balance between fairness and security is perhaps also behind the practice, as shown in this image, of administrative segregation prisoners taking part in a ‘group therapy’ session at San Quentin State Prison in San Quentin, California, US on June 8 2012. I found this image, part of set published online, profoundly shocking, partly for the commentary that such confinement was “undoubtedly for their own good”, but mainly out of incredulity that such an arrangement of cages could be thought to create an atmosphere conducive to rehabilitative therapy. Whether administrative segregation protects the institution from violent prisoners, or provides protective custody for vulnerable inmates, to my eyes these boxes create an image of inmates as caged animals. Although in the context of San Quentin, the concerns of prejudicing juries which inform debates over courtroom cages do not apply, the question of the effect of these cages both on prisoners’ own self-awareness and the perceptions of them which are generated by others, still remains. Whereas the “fairness” of a court of law may not be at issue here, the “fairness” of treating social beings in this way surely is. In a recent Written Statement to the United States Senate Committee on the Judiciary, Subcommittee on the Constitution, Civil Rights and Human Rights, Human Rights Watch stated that “based on years of research and analysis, we are convinced the unnecessary, counter-productive, and devastating use of this harsh form of confinement in many US prisons cannot be squared with respect for human rights”. Although HRW’s focus in this statement is of course on the ‘misery and suffering’ of those directly experiencing administrative segregation as a form of solitary confinement, there are questions to be asked, too, about the effect of these cages on those working with or visiting these prisoners. In many cases, those working with prisoners in ‘ad seg’, for example conducting interviews to protect their constitutional rights, or facilitating therapy as detailed in this image, conduct meetings with men in cages. Just as juries struggle to overlook cages in maintaining a presumption of innocence in the courtroom, holding prisoners in cages must make engaging in meaningful, constructive dialogue with these prisoners, and treating them as thinking, feeling individuals, an immense challenge, and must surely have an impact on the wellbeing of those professionals asked to undertake this work. The Justice on trial session at RGS-IBG raised fascinating questions about the function and use of space, and the conscious or unconscious impressions created by certain spatial arrangements and confinements. Taking these questions into the prison itself, it seems that if, as David Tait argues, fairness and security are in conflict in the courtroom, in the prison, security has triumphed.